In a bowl, mix together ground meat with garlic, parsley, basil, breadcrumbs, milk, salt and pepper. Fold using a large spatula or your hands until ingredients are evenly distributed (you don’t want to stir, rather fold, to keep the meat mixture from compacting too much). Divide mixture into 10 2-ounce balls (I used a large cookie scoop to portion out perfectly sized balls). Poke a hole in the center with your thumb, and insert mozzarella ball, then form meat around cheese to seal it in. Roll into a ball, then arrange on a pan or plate. Repeat with remaining balls. 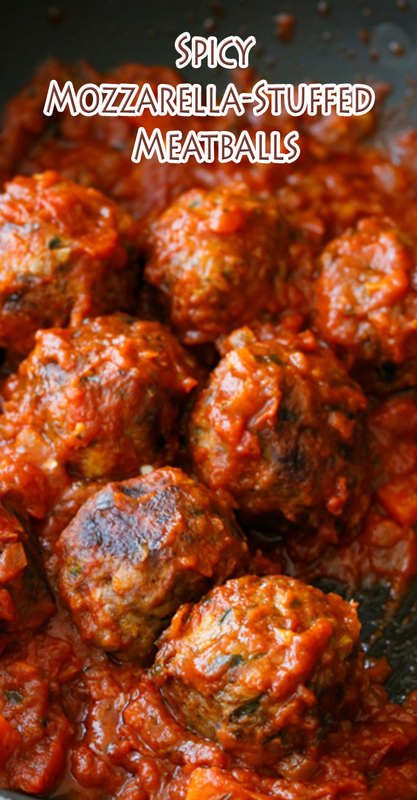 Refrigerate meatballs for 20 to 30 minutes. Heat oil in a large skillet or saucepan over medium-high heat. Add meatballs to pan, taking care not to overcrowd it (if you are doubling the recipe or have a smaller pan, you might want to cook these in batches). Cook meatballs for 7 to 10 minutes, rotating them every few minutes, until all sides are evenly browned. Reduce heat to medium-low. Pour Bertolli Rustic Cut sauce over top of meatballs. Cover and simmer for 15 to 20 minutes or until meatballs are cooked through. Spoon onto serving plates with additional sauce as desired and enjoy while still warm.